Paris: Éditions Payot & Rivages, 1996. This is the French edition of Finding Moon, published in 1996 by Éditions Payot & Rivages, translated into French by Danièle and Pierre Bondil. The cover art is by Peter Thorpe. 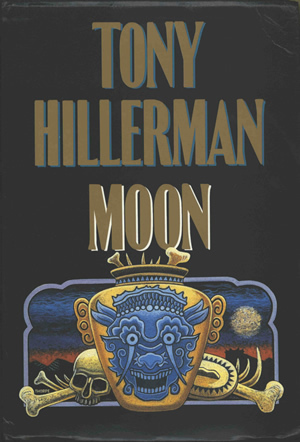 Similar in form to Thorpe's artwork for Hillerman's New Mexico-based mysteries, the drawing centers on a two-handled gold jar decorated with an ornamented blue face with open mouth. The author's name and French title are printed above the drawing in gold lettering on a black background. The back cover is printed in white on black, and contains a synopsis of the novel. Bar codes are printed at the bottom of the back cover in black on a reversed white rectangle. Binding: Full-color paper covers. The title and author's name are printed in gold on the spine.